First half goals from Kev Taylor and Chris Jackson seal win in an encouraging friendly performance against the York Prem outfit. An unfortunate start for Copmanthorpe saw the visitors lose two players to bad injuries. Update: No update on the injured players, seems the player’s in question may have rushed back from serious injuries. Cliffe FC wish them speedy recoveries. Cliffe opened scoring when the ball broke to Kev Taylor on the edge of the box, who slammed the ball into the net for 1-0. Chris Jackson doubled the lead before half time, when he headed the ball past the ‘keeper from an Andy Edwards near post cross. Jamie Hawksworth made some important saves in the Cliffe goal before the break. Cliffe continued to battle hard and play some nice football in the second half that contained numerous changes for both teams. 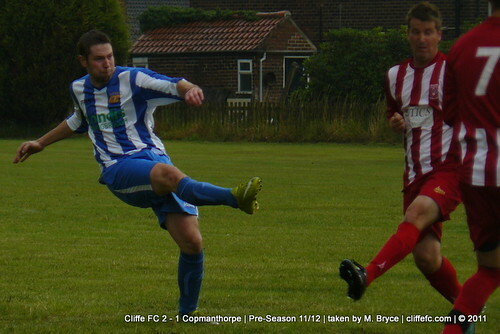 Copmanthorpe grabbed a goal back from long range after Ally Harris was caught way out of the Cliffe goal, 2-1. A few chances for Cliffe came and went before the full time whistle, 2-1 FT.
A very encouraging Cliffe FC performance against a Premier Division side which the Oxen Lane will take a lot of positives from as they go into Saturday’s opening Selby Cup match away to Thorpe United Reserves and next Wednesday’s visit of another Premier Division side, Riccall United.